Captain Harlock (キャプテン・ハーロック Kyaputen Hārokku) (also known as "Captain Herlock" for the English release of Endless Odyssey and as "Albator" in French-speaking countries) is a fictional character created by manga artist Leiji Matsumoto and the protagonist of the Space Pirate Captain Harlock manga series. Harlock is the archetypical Romantic hero, a space pirate with an individualist philosophy of life. He is as noble as he is taciturn, rebellious, stoically fighting against totalitarian regimes, whether they be earth-born or alien. In his own words, he "fight[s] for no one's sake... only for something deep in [his] heart". He does not fear death, and is sometimes seen wearing clothing with the number 42 on it. In Japanese culture, the number 42 is associated with death (the numbers, pronounced separately as "four two", sound like the words "shi ni"—meaning "to death"). The character was created by Leiji Matsumoto in 1977 and popularized in the 1978 television series Space Pirate Captain Harlock. 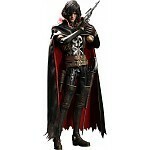 Since then, the character has appeared in numerous animated television series and films, the latest of which is 2013's Space Pirate Captain Harlock.